When he overtook them, he repeated these words to them. They said to him, “Why does my lord speak such words as these? Far be it from your servants that they should do such a thing! Look, the money that we found at the top of our sacks, we brought back to you from the land of Canaan; why then would we steal silver or gold from your lord’s house? Should it be found with any one of your servants, let him die; moreover the rest of us will become my lord’s slaves.” He said, “Even so; in accordance with your words, let it be: he with whom it is found shall become my slave, but the rest of you shall go free.” Then each one quickly lowered his sack to the ground, and each opened his sack. He searched, beginning with the eldest and ending with the youngest; and the cup was found in Benjamin’s sack. At this they tore their clothes. Then each one loaded his donkey, and they returned to the city. Now I am speaking to you Gentiles. Inasmuch then as I am an apostle to the Gentiles, I glorify my ministry in order to make my own people jealous, and thus save some of them. For if their rejection is the reconciliation of the world, what will their acceptance be but life from the dead! If the part of the dough offered as first fruits is holy, then the whole batch is holy; and if the root is holy, then the branches also are holy. But if some of the branches were broken off, and you, a wild olive shoot, were grafted in their place to share the rich root of the olive tree, do not boast over the branches. If you do boast, remember that it is not you that support the root, but the root that supports you. You will say, “Branches were broken off so that I might be grafted in.” That is true. They were broken off because of their unbelief, but you stand only through faith. So do not become proud, but stand in awe. For if God did not spare the natural branches, perhaps he will not spare you. Note then the kindness and the severity of God: severity toward those who have fallen, but God’s kindness toward you, provided you continue in his kindness; otherwise you also will be cut off. And even those of Israel, if they do not persist in unbelief, will be grafted in, for God has the power to graft them in again. For if you have been cut from what is by nature a wild olive tree and grafted, contrary to nature, into a cultivated olive tree, how much more will these natural branches be grafted back into their own olive tree. 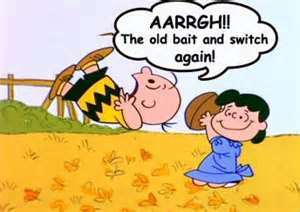 One of the oldest cons in history is the bait and switch. It’s a simple gimmick of promising one thing and delivering another, usually followed by a quick escape from angry customers. Jacob pulled this fast one one his father Isaac, getting the blessing away from his older (slightly) brother Esau. Perhaps the apple did not fall far from the tree because Jacob, promising help to his starving brothers, set them up by putting stolen goods in their bags, making them look like thieves instead of poor people begging for food. There is actually a fair amount of deception that occurs through the Old Testament in particular, among God’s people. Where does it come from and why did God allow it among those who were supposed to be models of faithfulness and holiness in the world? I think the answer to both of these questions is going to take us back to God Himself. God established relationships with people from the Garden of Eden to today and most of these relationships were based on some kind of promise, usually conditional, and usually involving an exchange of blessing for obedience and loyalty. Many times God delivers some kind of blessing initially with more promised to come in return for faithfulness. However, conflict arises and we find ourselves struggling to remain faithful. We begin to question the validity of God’s promise. We begin to suspect God may have pulled a bait and switch on us. The stories of this are many. Consider Abraham, who was promised a child – only to have it delivered 20 years later. Consider Moses, who indeed led God’s people to the Promised Land but could not pass over into it himself. David was anointed King of Israel 20 years before he took the throne – most of that time in waiting he spent as a refugee from his own people, hunted by the very government he was supposed to rule over. Job was faithful and lost everything, only to have it multiplied at the end. Two common theme in these stories are time and the purpose of blessing. We want fulfillment now, or at least 2 day shipping for free. God is looking at the long game. God is less concerned with what we acquire and more concerned with who we become. Most of the time saints are not created by comfort. They are made in the refining fire of persecution and hardship, where God’s blessing provides the right kind of relief that creates strength of character and trust in God. It also let us see the purpose of blessing is not for us to enjoy, but for us to pour into others and reflect glory back to God. It may sound unfair, but we need to remember that Jesus walked this path already. His temptation in the wilderness was to seek the blessing early and to take the glory for Himself. He chose to save His blessing for after His resurrection – out of obedience and trust in God, and patient love for us. God holds back those blessings sometimes because we are not yet ready to receive them in a way that will truly bring us closer to Him, or perhaps because we can be a greater blessing ourselves by going without for the present and receiving only later. Paul brings this all back to a common question: Do you trust God? Do you believe that He is good? Do you believe He will come through, even if you cannot see how? That is the essence of what faith and hope are, for we cannot hope for that which we already have. Do you believe God is the real deal, or are you stuck believing you are on the wrong end of a bait and switch? What promises has God given and followed through with you? How has God blessed you beyond your expectations? What are you waiting for from God right now?